Many people like to know about the shelter and breeding program and people behind the ferrets they adopt or buy. Here I will tell you a little about me and my facility. It all started with a little albino jill named Jedi and a cinnamon hob named Q (who have both, sadly, recently gone to the bridge). Through them I learned everything I could about ferrets and knew deep down that I wanted to help the homeless fuzzies. My shelter started in summer of 1997, and my first litter was in October of 1998. Since opening, I've rescued and rehomed over 300 ferrets and have been a proud grandma to 18 litters of babies. My name is Jen Galas and I am the shelter mom. I am a Licensed Veterinary Technician in the state of Nebraska. In addition to the ferrets, I am a proud mom to 2 Chesapeakes (Djinn & Jade), 1 Malamute/Shepherd Mix (Leroy), 6 cats (Sophie, Giles, Shadow, (D)Anna, Louis/Lucifer & Church), 2 cockatiels (Jersey & Benjamin), and a turtle named Peaches. I am married to a wonderful man named Joe, who day in and day out is kind enough to not only put up with me, but the 42 ferrets chasing him about trying to nip his toes. In the short time that I've been "in" ferrets, I'm proud to say that my little operation has been quite successful. We're home to Black Dragon's Sparkling Diamond (Satine), who made LOS National history by winning Best Cinnamon, 1st place in ALL THREE Judge's Cup Championship rings AND winning Judge's Cup Best In Show all at ONE event! I've worked hard to assemble some of the best pedigrees available in the ferret community, including many foreign bloodlines. I breed for temperament, conformation and color, in that order. While some people call me the "albino and cinnamon queen," all of my kits are well adjusted lovable family members. The shelter is another of my pride and joys. To this date, only one ferret has been returned to me (due to personality issues - she didn't like the other ferrets in the house), and I have many "repeat offenders," that is, people that have adopted multiple times from me and always come away happy. I take in ferrets for whatever reason, and also help those who don't want to give their ferrets away, but are having trouble in one way or another. I take in ferrets from local humane societies and private owners both, and all potential adoptors are screened before I place a ferret with them. I am strictly NO KILL...any ferret that doesn't find a home always has a home with me. 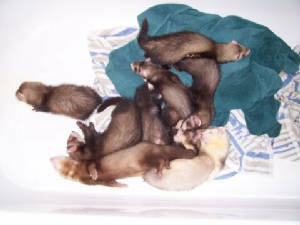 This is a picture of Venom's and Satine's litters from this year, all tuckered out after their first bath. They've grown quite a bit since this picture was taken, and I'll be adding more baby pics soon! There really aren't words to describe my ferrets, though one judge has been noted for her comments regarding Satine - "She's absolutely exquisite."